Tips from Real Simplifiers is a new series of posts in which I am sharing useful tips on simplifying from the Kanelstrand readers. Send your unique working tips on simple living to info@kanelstrand.com. Let us simplify together! Whether it's "chemo brain," a bit of underlying, lingering post-traumatic stress, burnout from too many years of too much multi-tasking or a combination of all of the above, I have, at times, become more easily tangled, overstimulated and overwhelmed. I'm working on practicing methods of untangling myself -- pausing, taking deep breaths, resting, mentally stepping back and looking at the bigger picture, trying to simplify, slow down, be mindful and work on better self-care, both physically and emotionally. Life has a way of tangling our minds but what we often miss is that it also has a way of untangling them. I find that often I end up in a similar position of being tired, overworked and generally apathetic on one level, despite of the inspiration that is flowing on the other. If I let the apathy prevail it ruins my creative work and overwhelms my emotions as well. In similar situations, to get untangled and to "breathe in calm" I instinctively look for nature. How about you? What tangles your mind and how do you untangle yourselves? Thanks for taking the time to comment, Angelique. Sonya, I am honored that you selected one of my quotes to layer atop one of your beautiful photographs. I feel a sense of calm just gazing at that landscape! Heartfelt thanks to you for sharing some of my thoughts on becoming untangled, and wishes to everyone for their own opportunities to untangle. Fantastic post! 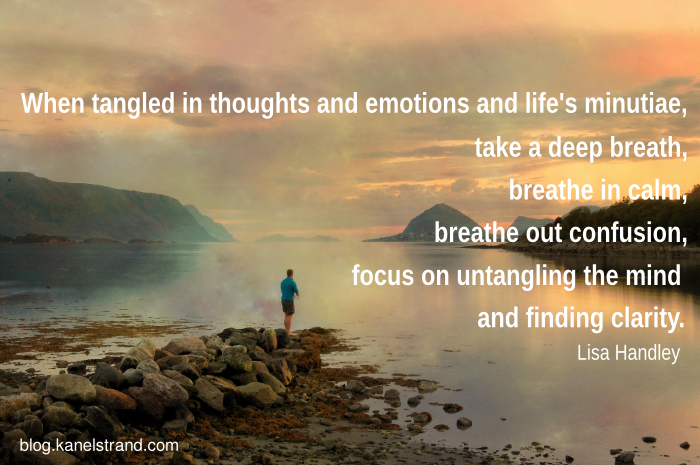 I love the concept of untangling your mind and finding calm. When I need to untangle my mind I also look to nature, a few minutes of sitting outside and listening to nature can do amazing things to relax a busy mind. I love your post especially the calm tone you have on it. As a mom of 4 young kids, business owner and blogger, it is really a tough juggle. Thanks for reminding me to calm down and lower the stress level. We all need it. How timely! I have been feeling like this a lot... Usually, figuring out a new concept and working on it is very fulfilling... yet I'm eroded by apathy. A strange mix.